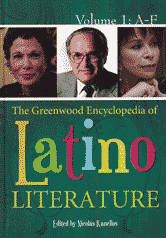 Surveys the vast landscape of Latino literature from the colonial era to the present. Aiming to be as broad and inclusive as possible, the encyclopedia covers all of native North American Latino literature as well as that created by authors originating in virtually every country of Spanish America and Spain. Entries cover writers, genres, ethnic and national literatures, movements, historical topics and events, themes, concepts, associations and organizations, and publishers and magazines.